In the field of ultra-cold research, the bottom is the limit. Science is full of zeroes. Light has zero mass. Neutrons have zero charge. A mathematical point has zero length. Those zeroes might be unfamiliar, but they follow a consistent logic. All represent the absence of a certain quality: mass, electric charge, distance. Then there is the puzzling case of absolute zero. We tend to think of hot and cold as relative things. A cup of hour-old tea, for example, is colder than the fire on your stove but hotter than an ice cube. Absolute zero represents the coldest possible temperature, which defies the this-versus-that pattern. How can there be a lowest temperature? The key to decoding absolute zero is understanding what temperature is. It’s simply a measure of how fast the atoms or molecules within a substance are moving — or, to be more precise, the average kinetic energy of those particles. Think of it as a game of atomic dodgeball. When the ball hits you, you feel its energy. Trillions and trillions of those dodgeball hits, happening on an invisibly small scale, are what we perceive as temperature. Fast-moving atoms hit hard, which we feel as a high temperature. When a hot object touches a cold object, the faster, hotter atoms impart some of their velocity to the slower, colder ones. The hot object cools. The cool object grows warmer. Now the zero in absolute zero makes sense: Absolute zero is the temperature at which the particles in a substance are essentially motionless. There’s no way to slow them down further, so there can be no lower temperature. Does everything stop moving at absolute zero? Not quite. Atoms aren’t entirely still; they wobble as a result of effects related to quantum physics. And, of course, the activity within each atom continues no matter how cold it gets. Electrons keep moving, as do protons and neutrons. Guillaume Amontons, a French inventor who lost his hearing in childhood and never went to college, figured out the basic concept in 1702. His experiments showed that air pressure is proportional to temperature, and he deduced that there was a minimum temperature at which pressure would drop to nothing. He even made an estimate of that temperature, minus 240 degrees C — remarkably close to the actual value. In 1848, the Scottish-Irish physicist William Thomson, better known as Lord Kelvin, extended Amontons’ work, developing what he called an “absolute” temperature scale that would apply to all substances. He set absolute zero as 0 on his scale, getting rid of the unwieldy negative numbers. Physicists now rely on the Kelvin (K) scale for temperature measurements. The energy left over from the Big Bang warms the whole universe, keeping it well above absolute zero. The average temperature of space is 2.74 Kelvin, or minus 454.7 degrees F.
Surprisingly, some celestial objects are colder than empty space. 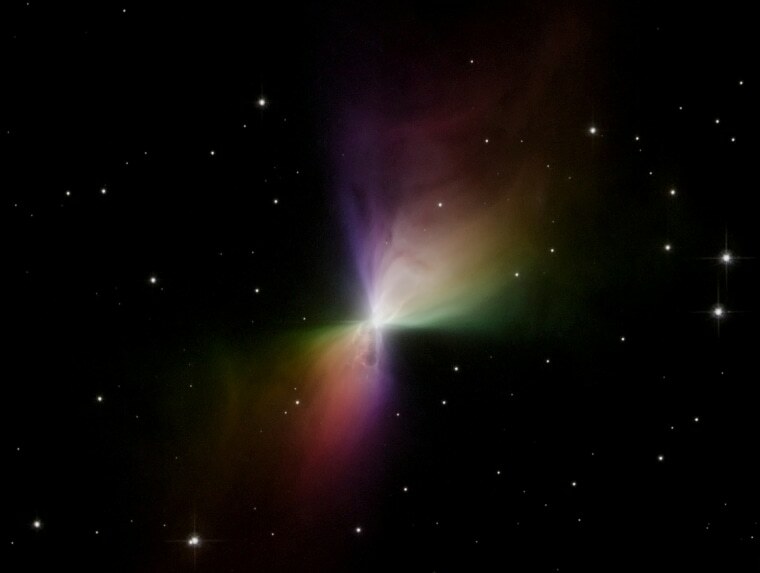 An expanding cloud of gas called the Boomerang Nebula behaves like an interstellar refrigerator. With a temperature of about 1 K, it’s the coldest naturally occurring location in the cosmos. But humans have gone colder than that right here on Earth. In 2003, researchers at MIT used laser beams to slow sodium atoms, cooling them to one-half of a billionth of a degree above absolute zero. That’s still the world record. What happens when matter gets that cold? If Thompson sounds excited, it’s because ultra-cold atoms behave in fascinating and potentially useful ways. For one thing, they lose their individual identities, fusing to form a bizarre state of matter called a Bose-Einstein condensate. “We have folks aiming to use condensates to do practical things like improving satellite navigation, while others are trying to test fundamental theories of physics or to simulate the physics of the early universe,” Thompson says. Close to absolute zero, it’s also possible to manipulate chemical reactions in ways that are impossible under other conditions. Last spring, Harvard chemist Kang-Kuen Ni assembled a molecule directly from two low-temperature, slow-moving atoms, making it the smallest chemistry experiment ever conducted. Under such conditions, the subtle effects of quantum physics become plain to see. “At these ultracold temperatures, we can actually observe the wave nature of atoms and molecules,” she says. Next, Ni hopes to explore undiscovered rules of chemistry and to design new molecules. Other likely applications of absolute-zero experiments include precision sensors and clocks — maybe even the ultra-powerful quantum computers that tech companies keep promising. In the field of ultra-cold research, you might say the bottom is the limit.